Place whole chicken in a large saucepan or stock pock. Add 3 L of filtered water and the table spoon of apple cider vinegar, and the salt. Bring to the boil, then reduce heat and simmer for 1.5 hours. If any scum comes to the surface, skim off and discard. 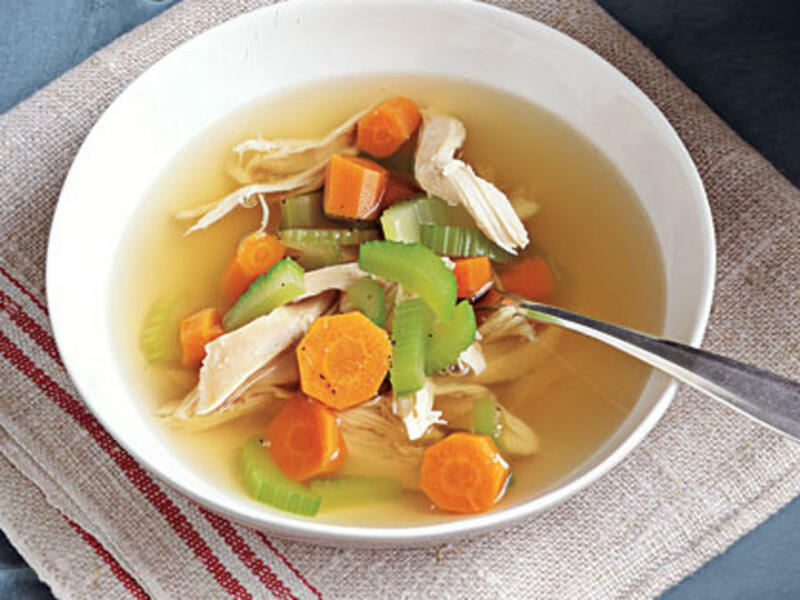 Remove chicken from stock – use a metal sieve to do this, as the chicken will be falling apart. Put the chicken aside to cool. Add all the vegetables, except the garlic, to the stock. Bring back to boil and simmer for 25 minutes. After the heat is turned off, add in the garlic and mix through. You can serve as is, or use a stab blender to make a smoother soup. Take the meat off the chicken when it is cool enough to handle. Add some meal to each bowl of soup, and save the rest of the meat for packed lunches.